Things to do on Monday! Continue calling on the #TrumpTaxScam! It matters! Yes, it matters. Even if you have a Democrat for a Representative and/or Senator, it matters. If calling seems to take too much time, try these tips to make calling faster. If calling makes you nervous, read here about how to make it easier. The national debt will explode way beyond what the tax cuts could possibly do to generate business. Much will go to foreign investors ($700 BILLION!). Much will be parked away from American soil. They will destroy Medicare and Social Security to pay for it. The health insurance market is almost certain to implode next year, BECAUSE of the repeal of the individual mandate. The CBO estimates that 13 million Americans left without health insurance. One illness or injury can push hard-working people into medical bankrupcies. Rural hospitals will close. The elimination of important local tax deductions, and with it the pressure of deep cuts to education. The highest rate dropped from 39.5% for those earning over $470,000 to 37% for those earning over $500k for singles and $600K of married couples. Merry Christmas indeed! The estate tax withholding doubled. The Trump kids will have a very merry holiday indeed. The looters removed the corporate Alternative Minimum tax, which made it difficult for corporations to reduce their tax bill lower than 21%. The tax loopholes Trump promised to get rid of are still there, of course. Repatriation of American investments back here isn’t going to happen. Income inequality is going to expand. Welcome to the circumstances preceeding the Great Depression. This #TrumpTaxScam will be judged as the most regressive tax bill of our generation. Analysts have gone back 50 years to be sure. The cost of the GOP tax scam can exceed $2 TRILLION dollars! “The GOP tax bill would cost significantly more if tax cuts that are temporary in the legislation are eventually made permanent, according to two new reports.” Which cuts are those, you wonder? Not the ones for corporations! The GOP’s rush for a final Trump Tax Scam vote is truly a last ditch effort. Doug Jones’ victory in Alabama — powered by a fired up electorate of progressives who are getting out there and working hard — is a sure sign that Americans are ready to reject Republicans’ vision for the country. That is why they’re in a hurry. Plus Trump wants a BIG Christmas gift. From us. Minimal Script for senators only: I’m calling to from [zip code] to ask that Sen. [___] to refuse to take a final vote on the tax scam until the new duly-elected Senator from Alabama is seated. Minimal Script for both senators and representative: I’m calling to from [zip code] to ask that Rep./Sen. [___] to vote against the disastrous Republican tax bill and to return to regular order for these incredibly important issues. Take part in Indivisible’s Peer-to-Peer calling tool to reach people in RED states! Take part in local protests outside GOP offices! TODAY! The Grinch of the 25th Tax Vote Action! 12/18 at 4 pm we’ll do it again! Groups from in and out of the district will be protesting the GOP Tax Scam at Knight’s Palmdale, Santa Clarita and Simi Valley offices. We’ll show Knight the “Flip the 25th” movement has grown larger and stronger over the year and we’ve only just begun. On board so far: ACLU Antelope Valley, Burbank Democratic Club, CA25 United for Progress, CADEM, Civic Sundays, Democratic Alliance for Action, Democratic Club of the High Desert, Indivisible AV, Conejo, Northridge, SFV and Ventura, L.A. Federation of Labor, Planned Parenthood, SCV Young Dems, Simi Valley Democratic Club and WIN. 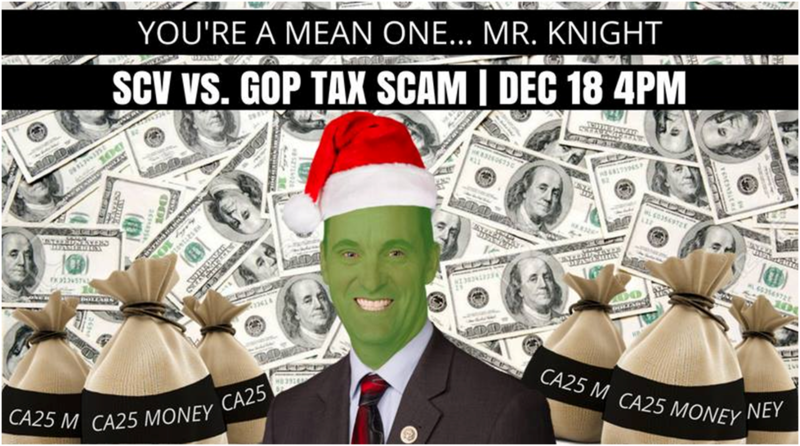 Knight needs to know he must vote NO on the #GOPTaxScam or, like The Grinch, he will be held accountable. Bring signs. Costumed characters, “ugly” Christmas sweaters and holiday attire suggested. We need singers! And videos of this! We say work together, they say no man! Come watch history be made at City Hall in Ventura at 6 pm tonight! Help decide how Ventura will be divided into voting districts! A Public Hearing to discuss draft maps will be held tonight, Monday, December 18, 2017. By State Law, maps to be considered by the Council at the December 18, 2017 Public Hearing, had been posted online by November 27, 2017. The below maps have been processed by the demographer. These maps originated either as submittals by residents or the demographer after hearing public testimony. The Maps were numbered as received. Use this link to view all Maps on the online interactive viewer. Each Map (1-33) may be selected in the layers box to display each map for viewing. (From CAUSE) Our map made it into the top 4. Tomorrow night, the council will be choosing from maps 11, 16, 22, 23. Here’s our letter to the City Council to explain why we hope they will choose map #22. Come join in and help us achieve this important goal. Posted on December 18, 2017 December 18, 2017 by indivisibleventuraTagged #TrumpTaxScam, Indivisible Ventura, Phone Calls. Previous Previous post: Fight! Make their phones ring! Fill their voicemail! Show up at their offices! Next Next post: Nobody is Above the Law – Be Ready!